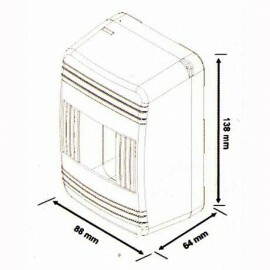 Surface mounted Distribution Board1 Row2 ModulesWithout doorIP20Diamensions 44mm x 64mm x 120mm.. 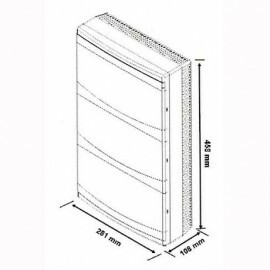 Surface mounted Distribution Board1 Row2 ModulesWith doorIP20Diamensions 77mm x 95mm x 138mm.. 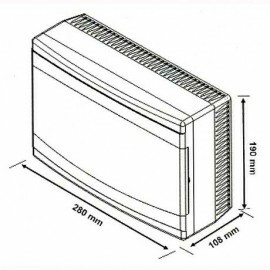 Surface mounted Distribution Board1 Row4 ModulesWithout doorIP20Diamensions 88mm x 64mm x 138mm.. 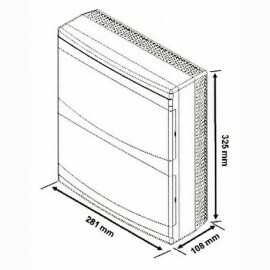 Surface mounted Distribution Board1 Row6 ModulesWith doorIP20Diamensions 185mm x 102mm x 140mm.. 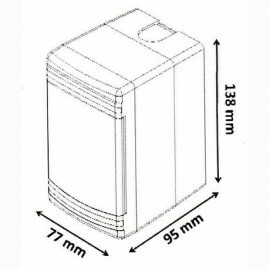 Surface mounted Distribution Board1 Row9 ModulesWith doorIP20Diamensions 217mm x 106mm x 158mm.. 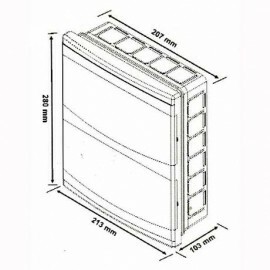 Flush mounted Distribution Board1 Row9 ModulesWith doorIP20Diamensions 217mm (212mm) x 104mm x 158mm.. Surface mounted Distribution Board1 Row12 ModulesWith doorIP20Diamensions 280mm x 108mm x 190mm.. 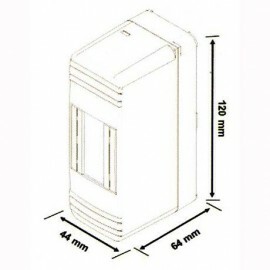 Flush mounted Distribution Board1 Row12 ModulesWith doorIP20Diamensions 280mm (260mm) x 105mm x 190mm.. 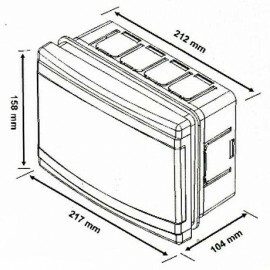 Surface mounted Distribution Board2 Rows18 ModulesWith doorIP20Diamensions 213mm x 103mm x 280mm.. 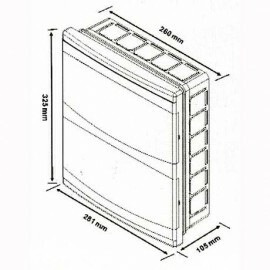 Flush mounted Distribution Board2 Rows18 ModulesWith doorIP20Diamensions 213mm (207mm) x 103mm x 280mm.. Surface mounted Distribution Board2 Rows24 ModulesWith doorIP20Diamensions 281mm x 108mm x 325mm.. 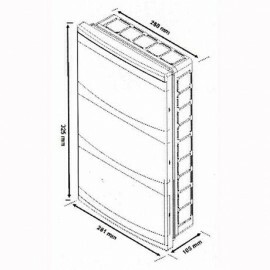 Flush mounted Distribution Board2 Rows24 ModulesWith doorIP20Diamensions 281mm (260mm) x 105mm x 325mm.. 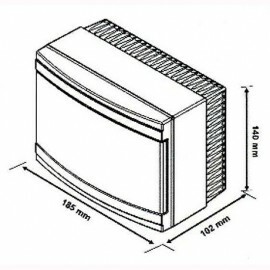 Surface mounted Distribution Board3 Rows36 ModulesWith doorIP20Diamensions 281mm x 108mm x 458mm.. 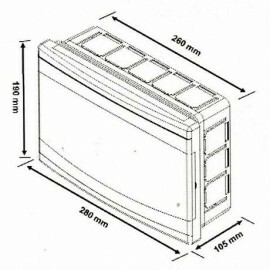 Flush mounted Distribution Board3 Rows36 ModulesWith doorIP20Diamensions 281mm (260mm) x 105mm x 458mm..